Who’s the oldest singer ever to have a #1 hit record? Here's a hint.... that's him in the photo. That's me, 41 years ago -- and at least 41 pounds lighter. The answer is Louis "Satchmo" Armstrong. He had the #1 song, "Hello Dolly", in 1964 when he was 63 years old. I've always loved Satchmo's music, and I've encountered him -- in person -- three times. The first time, in 1957, my big sister Sara took me to a Louis Armstrong concert at the Bell Auditorium in Augusta, Georgia. Following the concert, I made my way backstage and got his autograph on a little 3x4 piece of paper. My second encounter with Louis was in the spring of 1965, also in Augusta. That's where the accompanying photo was taken. He was in Augusta for a concert, and I went to his hotel on Reynolds Street, and we filmed the interview in a banquet room there. To my dismay, the film of that interview was lost in the processor.... but luckily we managed to salvage the audio track, which I still have. I seldom let anyone hear that interview, since I was young and trying to tame a conspicuously pronounced southern accent. To my ears I sounded like a cross between Larry the Cable Guy and Gomer Pyle. 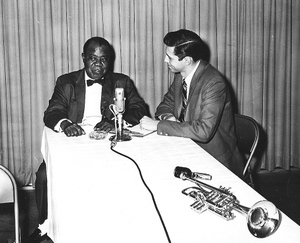 My final encounter with Louis Armstrong was not long after I moved to Nashville. It was 1970 -- eight months before his death -- and he was a guest on the ABC-TV Johnny Cash Show being taped at the Ryman. I watched in awe from the balcony. Louis Armstrong died 35 years ago -- July 6, 1971. Even after he died, Louis wasn't through having hit records. In 1988.... when he would have been 87 years old.... his recording of "What A Wonderful World" reached #32. And he still wasn't through. In 1994, he had a chart record titled "We Have All The Time In The World". If he had been alive then, he would have been 93 years old. That song holds the record for the longest gap between an artist's date of birth and the date of a hit record. And I'll make you a bet that he's not through yet. Louis Armstrong is a legend, 'nuff said. As one of the foundations of modern jazz music, he immortalized many hits like "Mack The Knife" and "What a Wonderful World." A legend like him deserves to be remembered by the present and future generation.